Our viewers soon will be privileged to watch the art work of amazing Polish artist, a global personality, whose work is significant not only in his homeland, but also in the scale of the world art. The artist’s solo shows were held successfully on all continents. Lapinski has been honored with many top awards including the proclamation of “Lapinski Day” in a year calendar by President Ronald Reagan. Notable awards include: the UNESCO Prize from France; Gold Medal Statue of Victory of Calvatone, Italy; Gold Medal Audubon of New York City; Outstanding Man of the 21st Century of the International Biographical Center of Cambridge, England. 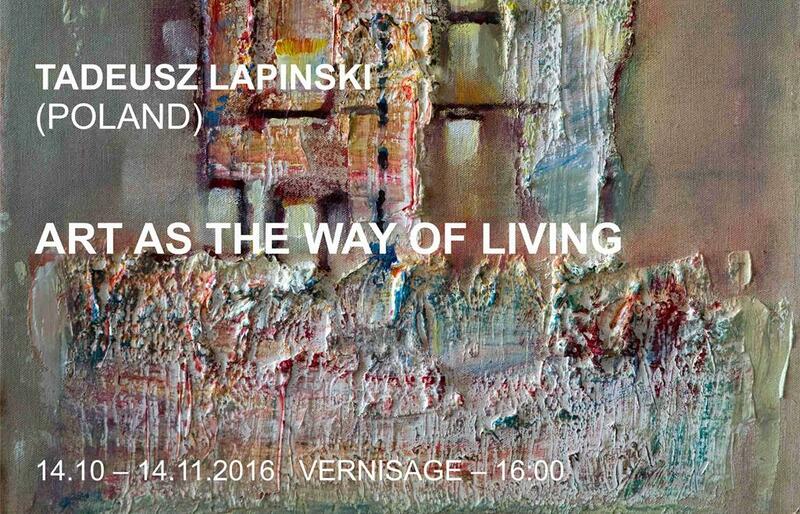 For us, this exhibition is precious by the fact that Lapinski’ artistic approach in its deep essence correlates with the ideas and aspirations of Mark Rothko, who had become for the young artist mentor and friend. He received from his mentor “direct transfer”, as his student at New York University in the years of 1963-64 and formulated it as follows: “…The artist must put away all trials of reproducing the world but focus on giving it a cognitional sense and concrete moral aims. It doesn’t seem to me that there was ever a question of being abstract or figurative. In fact it is an issue of finding the silence and loneliness, breaking and spreading the arms again.” T.L.